On this date (April 22) in 1954, the infamous Army-McCarthy hearings began in the Senate. Senator Joseph McCarthy began his career in 1950 and quickly rose to prominence as a fiery opponent of communism. In 1954, he began a Senate probe into the U.S. Army that eventually led to televised hearings. As the nation watched, McCarthy appeared to bully witnesses. Later in 1954, the Senate would vote to censure the junior senator from Wisconsin due to the perception that he had crossed several lines. How did Senator Gore react to McCarthy and McCarthyism? How did his constituents, the residents of Tennessee, feel about the issue? Many Tennesseans, like H.D. 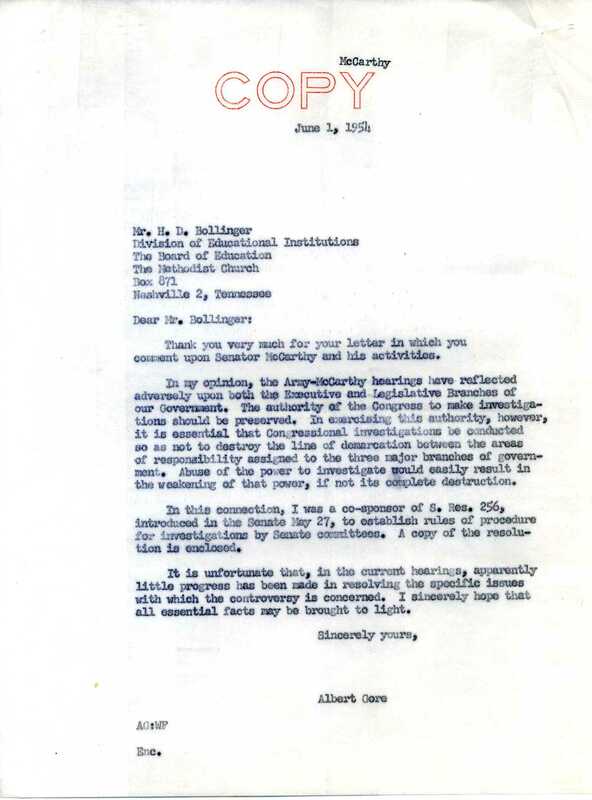 Bollinger, expressed concerns about the negative impact that Senator McCarthy was having on America’s image abroad. Senator Gore agreed, writing that his primary concern was with McCarthyism’s impacts within the government itself. H.D. Bollinger expresses his concerns about McCarthy’s impact on America’s image abroad. 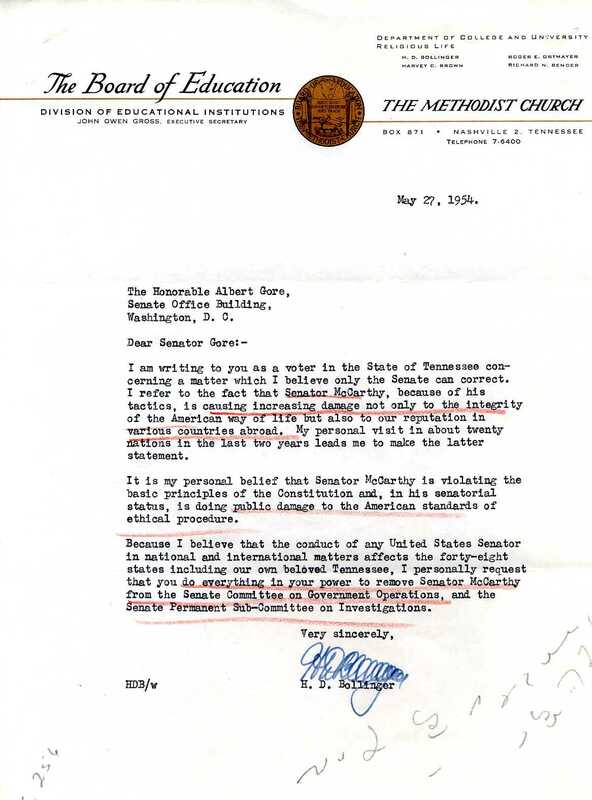 Senator Gore agreed with Bollinger about the impacts of McCarthyism on the Executive and Legislative branches’ responsibilities. 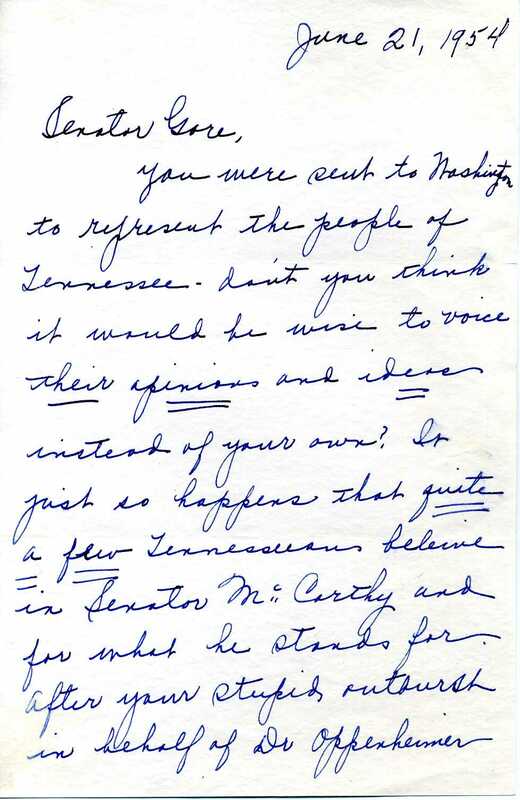 Some Tennesseans, however, disagreed with Gore and vehemently supported McCarthy. 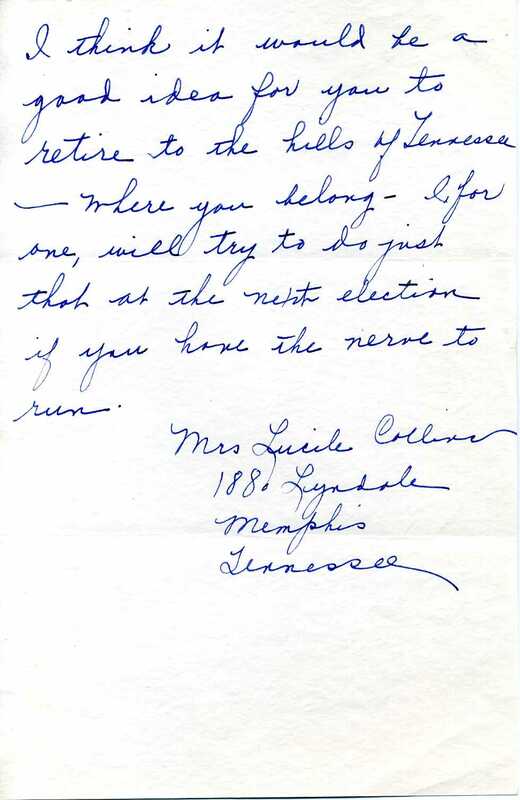 Lucile Collins feels that Gore should represent the opinions of Tennesseans, who are avid supporters of McCarthy, in her view. 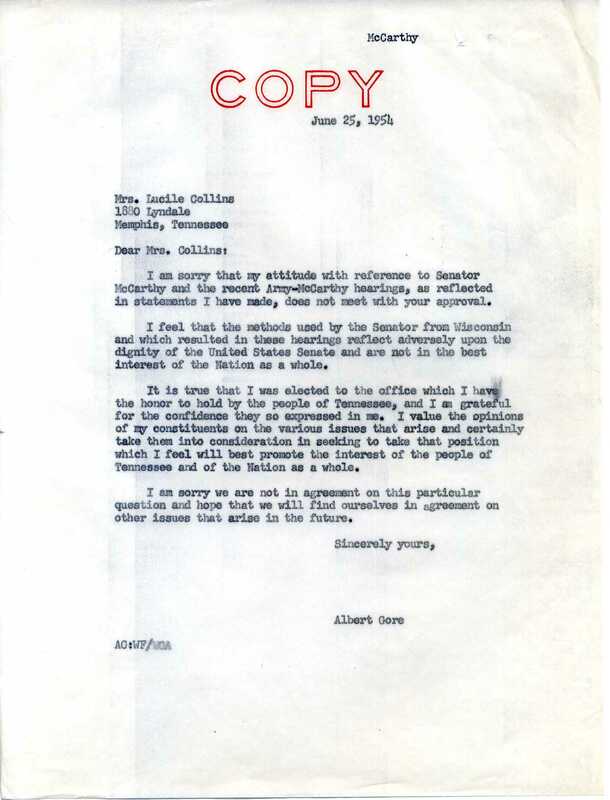 Senator Gore expressed his regret for their disagreement, but stands by his opinion that McCarthy’s actions were reflecting negatively on the United States. By November of 1954, the Senate was preparing to vote to censure McCarthy for his actions and general behavior. Several constituents wrote to Gore to condemn McCarthy, but some still supported the Senator. On December 2, 1954, the Senate voted 67-22 to censure McCarthy–one of the few times in history the Senate has officially disciplined one of its members. Senator Gore missed the vote (he was appointed a delegate to an international trade conference in Geneva, Switzerland), but announced his support for the censure. Senator Gore voices his support for the censure.